PHUKET: Over 50% of tsunami alert facilities in Phuket are not working, and up to 80% of tsunami and disaster warning system equipment nationwide is now out of order, warns the deputy director-general of the Department of Disaster Prevention and Mitigation (DDPM). The department aims to fix all of the equipment in the six Andaman coastal provinces by the end of October, said deputy director-general Kobchai Boonyaorana. 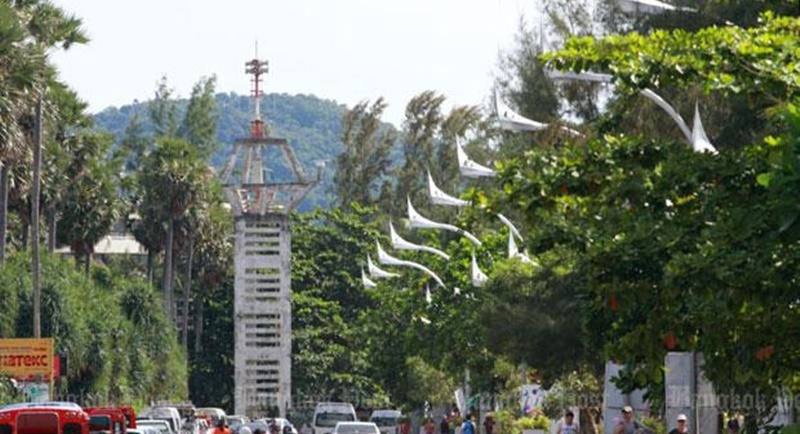 “Out of the eight siren towers in Phang Nga, five are out of order. But all four broadcast towers are working,” he said, adding that out of 19 facilities in Phuket, 11 are out of order. Mr Kobchai said part of the delay in the maintenance was due to the transfer period, as the National Disaster Warning Centre was moved from the former ICT Ministry to the DDPM, which is under the Interior Ministry. The transfer was completed in November 2016. He said the budget has been allocated to the department, and it will work to repair the system and maintain the equipment on the basis of priorities. Apart from the warning system in the six provinces, mainly focused on tsunamis, there are also disaster warning systems in other parts of the country, focusing on different kinds of disasters, said Mr Kobchai. “We’ve got the budget already but repairs will take time, as some parts must be imported,” he said. Suparaporn Jakmanon, acting director of the National Disaster Warning Centre, said B133 million has been allocated to take care of 3,067 disaster warning systems and related equipment. Meanwhile, Mr Kobchai said the department will use other channels to alert the public, including television and radio, sending information to authorities at provincial, district and local levels. Line and SMS notifications will also be used, he said. On the community level, local authorities would have to use every means to alert the public including radio, hand-held speakers, whistles and trucks equipped with loudspeakers, he said. He said the first key to effective warning is the evaluation of the risks and the time available before the areas will be hit. “Once an earthquake happens, we take around 10 minutes to analyse the information, and it can take up to 20-30 minutes to make sure if there is a high chance of a tsunami,” said Mr Kobchai. Another factor is local people’s trust in the warning system. They also need regular drills, he said. “We asked victims of recent flooding, whose damage was severe, whether they received warnings from authorities, and they said they didn’t, thinking the flooding wouldn’t come so fast,” said Mr Kobchai, adding that had contributed to doubts regarding the system. Maitree Jongkraijug, a leader of a community-based disaster risk management team in tsunami-hit Baan Nam Khem in Phang Nga, said although the community are alert and ready to cooperate, effective collaboration is still needed between the department and local authorities. The community recently opened a shelter tower that was built over a decade ago. Property rights issues prevented it being opened earlier. Eagle, referring to comment to Pendejo, it's called hyperbole, but hey, just why did you mention 6 and 80, these are random, as any age would have sufficed, eg 5 and 60, 10 and 90. Perhaps you didn't really need to comment, but found an overpowering urge, deep inside yourself, simply to comment. What makes these towers go out of order? Can't be usage or worn out since they're rarely used or tested. Is it vandalism? Are parts being stolen? Eagle, it's "maths". Everyone knows the last time there was a Tsunami, yes they had people going round with loudspeakers and megaphone's warning everyone in??? Yes you guessed it, in Thai only! Pendejo,99% of Thais have their attention blalblabla.Could you tell us where you got those numbers from?If true it would include a lot kids aged up to 6 years and most people over 80.Personally i think math is not your strength and it is just another thoughtless biased comment. So if we see people in hotel lobbies thrashing about in high water,  that will let us know for sure there\'s a tsunami. rawaiozman...couldn\'t you comprehend the article? How can this possibly be let to happen?? Somebody in government needs to be held accountable. The warning system should be checked monthly and fixed when not working so that they system is up and running 24/7.